The warm temperatures of spring through fall bring many butterflies to Southern California gardens. From the large and dramatic Western Tiger Swallowtail to the miniscule Pygmy Blue, their bright colors and interesting behavior add much to our warm season gardens. Butterfly-watching is enjoyed by all ages – and can be done inexpensively and comfortably in even a small garden. It’s no wonder that interest in butterflies is growing. 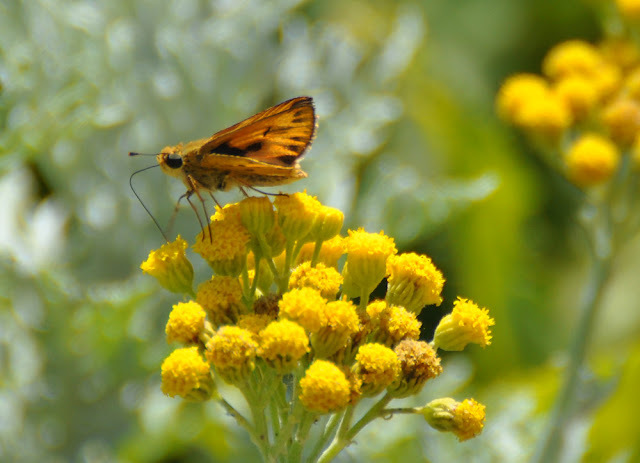 Common to California gardens are the small orange/gold, brown and black butterflies known collectively as the Skippers. The Skippers, in the family Hesperiidae, are best viewed as ‘sisters’ to the rest of the butterflies. Their characteristics place them somewhere between the butterflies and the moths . Fiery Skippers are native to Southern California and beyond. Their range is limited by cold winters, so the year-round range is limited to warmer areas like Southern United States, Southern California, the West Indies and Central America south to Argentina and Chile. But they commonly stray further north (and to higher elevations), creating yearly colonies even as far north as northern California, the lower Mid-west and southern New England. 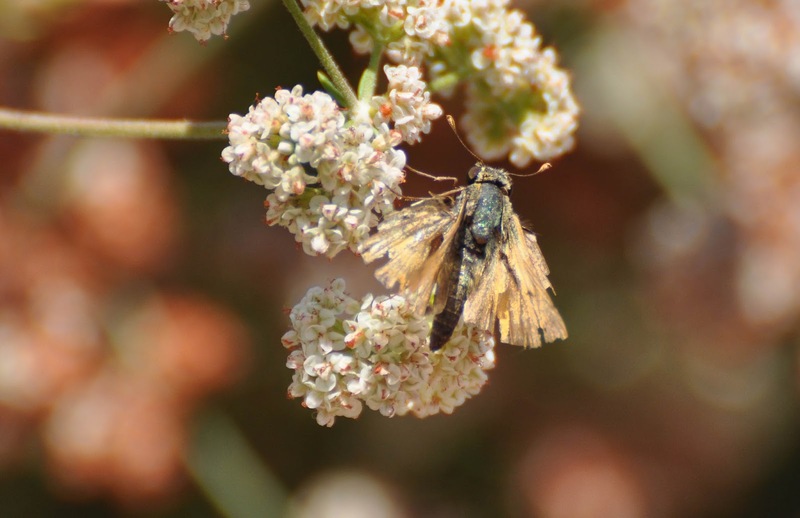 They are very common in western Los Angeles County gardens, fields, parks and other grassy places. The genus Hylephila, which is largely neotropical in range, contains 21 species. 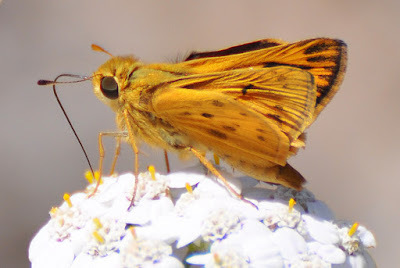 All look somewhat similar to the Fiery Skipper: blotched yellow-orange and black on their upper sides and paler yellow with dark spots on their undersides. In all, the females are duller colored, with more dark areas than the males. Fiery Skippers are smaller butterflies, with a wingspan ranging from about 1.25 to 1.5 inches (approximately 3 to 4 cm.). They have stout, hairy bodies with a tapered abdomen (tail segment) and very short, distinctive antennae (see above). Their large, dark eyes contrast strongly in their yellow-white faces. They perch with their wings either closed or, more commonly, with both the hind and forewings visible. Fortunately, they can be easily photographed. Male and female Fiery Skippers have slightly different coloration. The males are the Fiery ones. One can’t help but photograph the males - they are just so attractive! Amongst all the photographs of Fiery’s I’ve taken, the vast majority are of males (sorry, ladies!). We’ll try to do better in the future. Not surprisingly, there are differences in coloration across the species’ wide range . If you live outside Western Los Angeles County, your Fiery’s may look different from ours. But Hylephila phyleus males are always more brightly colored. 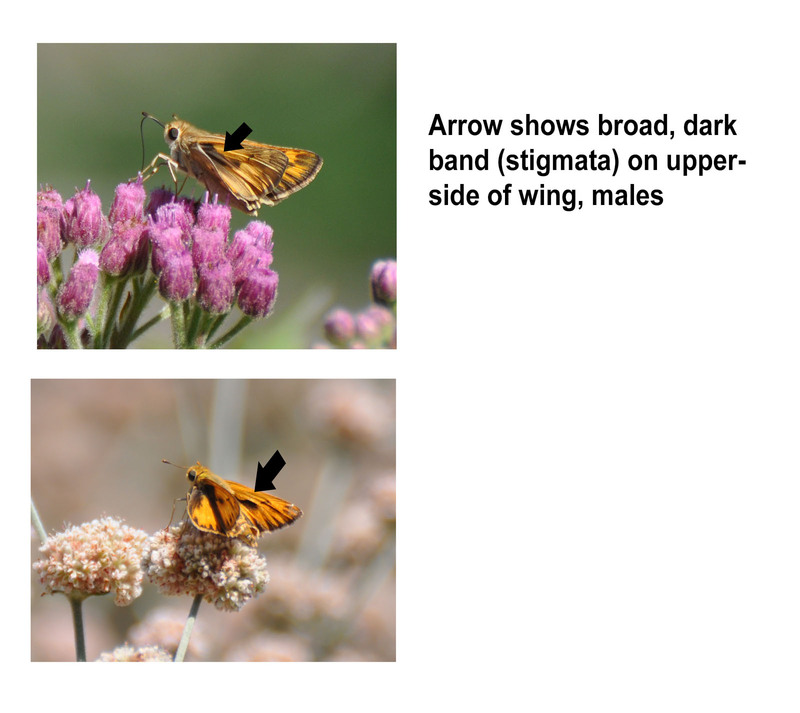 The overall impression of the male is of a small, bright yellow-orange butterfly with black streaks; of the female, a dark brown Skipper with some yellow-orange blotches. In local specimens, the underside of both males and females is a pale buff to light yellow-orange, with the males being more orange and females more buff. The males have a small number of small, irregular brown spots. The underside of the females is paler and has a series of light brown checks (see below). The female underside could be mistaken for the less common Sandhill Skipper (Polites sabuleti), although the Sandhill has more distinctive and darker checks (at least in our gardens). The upperside of females is darker – brown to almost black – with an irregular band of orange blotches. The orange is paler than that of the males. 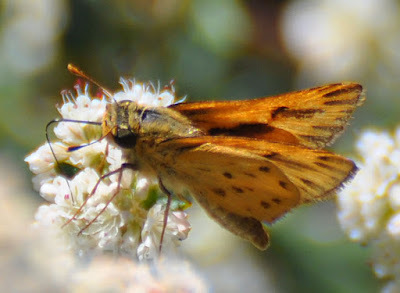 From the upperside, females might be mistaken for the rarer (in gardens) Field Skipper/ Satchem (Atalopedes campestris). 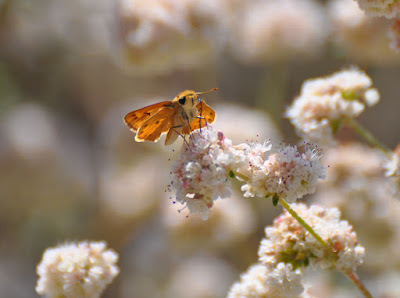 But in our gardens, where the Fiery Skippers far out-number the Satchems, a dark brown Skipper with orange blotches is usually a Fiery female. The bodies of both sexes are covered in long, golden hairs. The lower ‘face’ and underside of the body are light gray or white. The legs are yellow or buff. The proboscis (tongue) used for feeding is dark (see above). 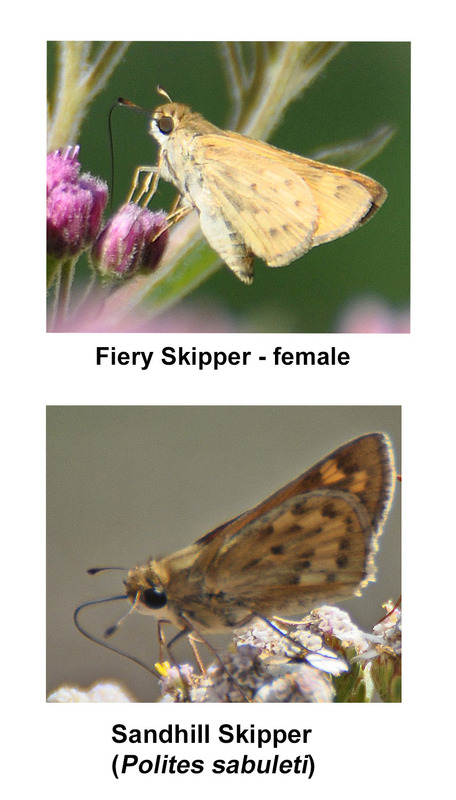 In colder climates, Fiery Skippers die off in the winter. At lower elevations in S. California, they can be seen most of the year - though in reduced numbers during the colder months. Peak months in our gardens are late June through September. Several broods hatch each year in most parts of the species’ range. So you will see fresh young butterflies and older, tattered ones, at the same time. In summer, males perch on grass or flowers, waiting for receptive females. Their bright colors, and the scent of pheromones (released from the stigmata) attract the females. Adults are often found in groups of 10 or more at a given site. Adult Fiery Skippers can also be seen feeding at many types of flowers. They seem to particularly favor the many small flowers of the Mint and Sunflower Families and the native Buckwheats. The best Skipper plants in our gardens are the Monardellas, Yarrow, Grindelias, Senecios, Pluchea, Goldenrods and all of the Buckwheats (Eriogonum species). They also utilize many non-native garden flowers. You will even see them in vegetable gardens! The Hylephila phyleus larvae, like those of other ‘Grass Skippers’, eat grass. 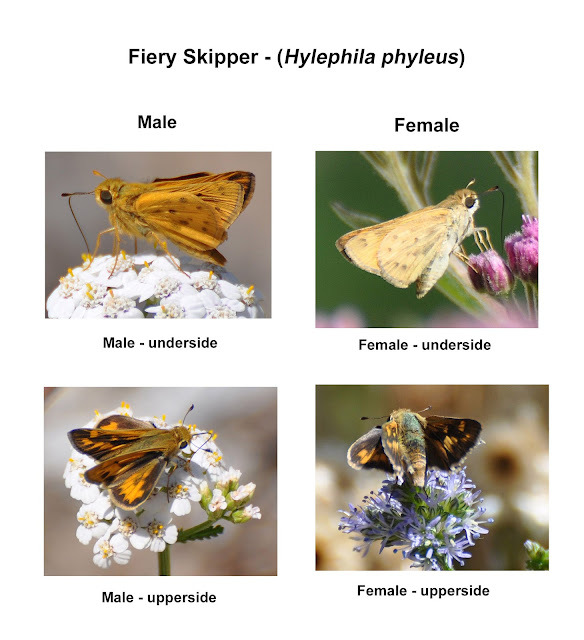 They utilize a number of native and non-native grasses; where there is any type of lawn or weedy grass, there will likely be Fiery Skippers. Eggs are usually laid on the underside of grass leaves, but may also be laid on other plants. The caterpillars tie the edges of a grass leaf together, creating a protective shelter. You may see these ‘tents’ in your grass, but they are easy to overlook. The caterpillars themselves are tan to green, less than about an inch, striped and with a large, dark head. They blend in pretty well with the grasses on which they feed. You’ll have to look hard to find them. 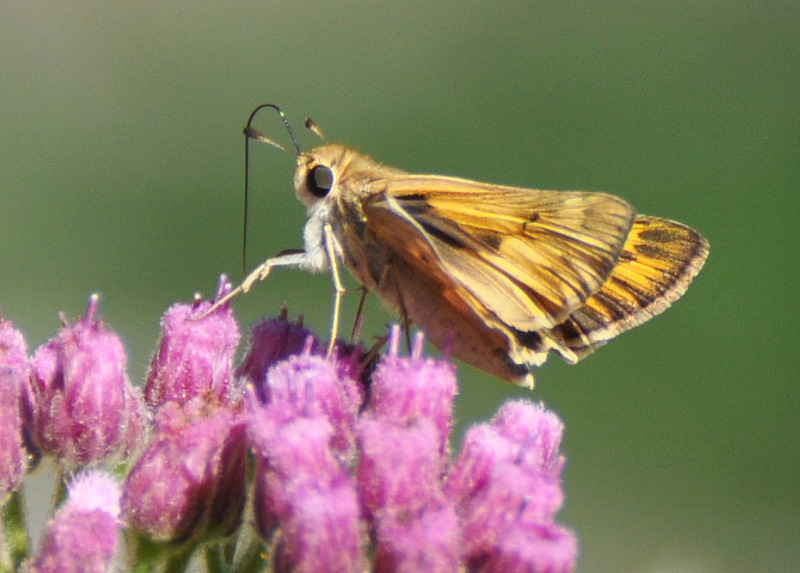 We hope you’ll look for Fiery Skippers in your garden or other outdoor places. They are very active this time of year. Though small, they are beautiful and fun to watch. Happy viewing! A number of native berry fruits come ripe in summer. Many have singular flavors that truly represent the ‘taste of California’; their flavors work well in many types of recipes. Included are the native strawberries (Fragaria species), currants and gooseberries (Ribes species), roses (rose hips – Rosa species), blueberries/huckleberries (Vaccinia species), Blackberries/raspberries/thimbleberries (Rubus species), wild grapes (Vitis species) and of course the Blue elderberry. 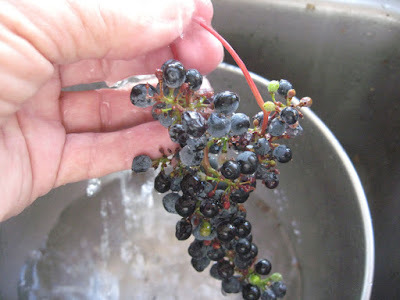 We’ve already discussed the picking, preparing and saving of elderberries: http://mother-natures-backyard.blogspot.com/2012/08/picking-cleaning-and-processing.html. But the others are coming in quickly, so we decided to share our experiences picking, preparing and storing some of the rest. Here are some tips for saving the flavors of native berries and berry-like fruits. We’ll provide recipes using these fruits in future posts. 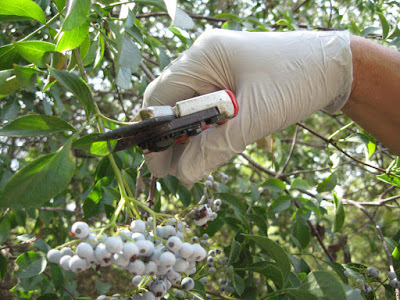 · If possible, pick fruits that have not been sprayed with pesticides. Many native plant gardeners never use pesticides, so this may not be a problem. If you have used pesticides on fruits, be sure to follow the instructions on the pesticide package regarding safe use. · If possible, pick in the morning (before 10 a.m.) when flavors are often the most intense. These fruits are mostly dark colored and slightly soft when ripe. Most detach easily from the branches. Simply pull them off and drop into a bowl or small picking bucket. If the bushes have thorns/prickles: wear long, leather rose-pruning gloves (well worth the investment). 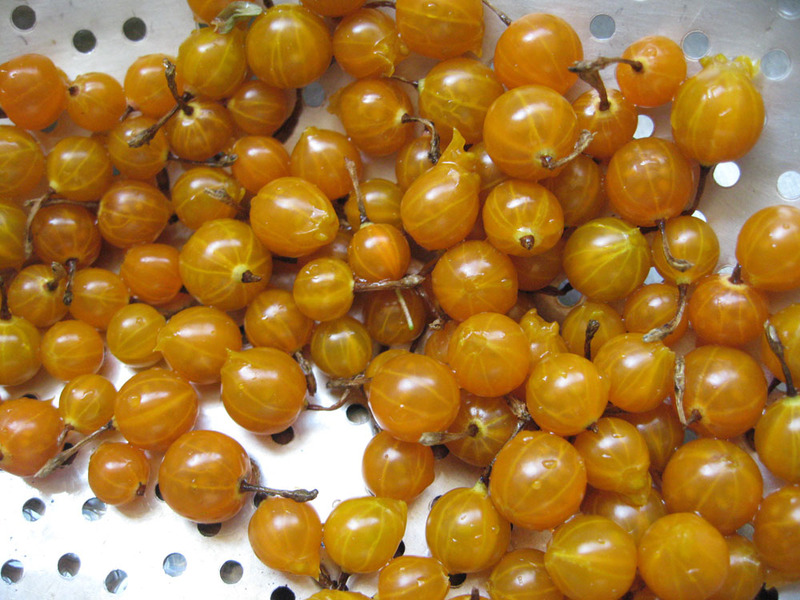 These are dark red or red-orange and slightly soft then ripe. You can taste or smell the sweetness. We cut off individual fruits with a kitchen scissors or light-weight pruner. These are either blue (Elderberries) or dark purple (grapes) and slightly soft when ripe. We cut off entire clusters of fruits, put in a plastic bag, then complete the processing in the kitchen. 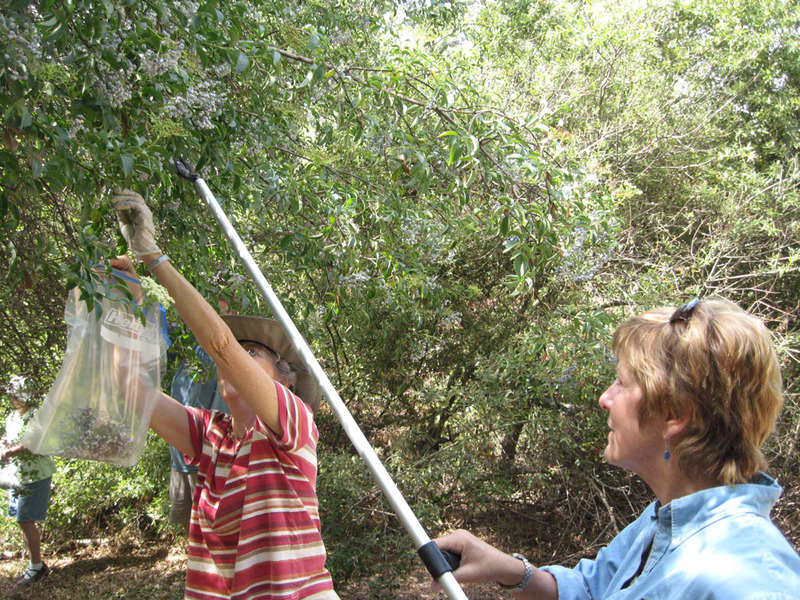 · Remove any twigs, leaves, etc. · Rinse the fruits in cool, running water. We like to use a big, old-fashioned colander (see above). Save the rinse water and use it to water plants in the garden (it’s perfectly safe). 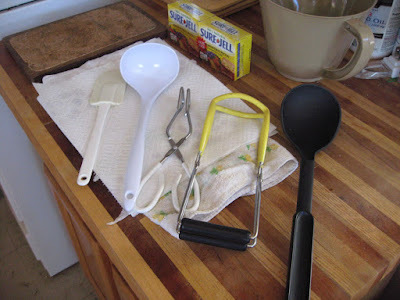 Remove stems and leaves from strawberries with a knife or strawberry huller. For elderberries, follow the tips in our elderberry posting: http://mother-natures-backyard.blogspot.com/2012/08/picking-cleaning-and-processing.html. Wild grapes are small, soft and harder to remove from the stems. If you place the unwashed fruits in the refrigerator overnight (or even for several days), the fruits will come off easier. We suspect that the cold triggers a chemical reaction that loosens the bond between stem and fruit. We’ve also found it easiest to rinse entire clumps of grapes first, before removing fruits from the stem. Detach the fruits over a bowl or large pot; that way you’ll collect all the juice and smashed grapes as well as the whole ones. And you will crush some! Don’t worry; you’ll likely be making juice from them, anyway. If you’ve room in your freezer, freezing fruits is a good way to preserve them for later use. It’s also a good way to deal with fruits that have a prolonged ripening season (like Bramble fruits, which may have individual fruits ripening over a month or more). 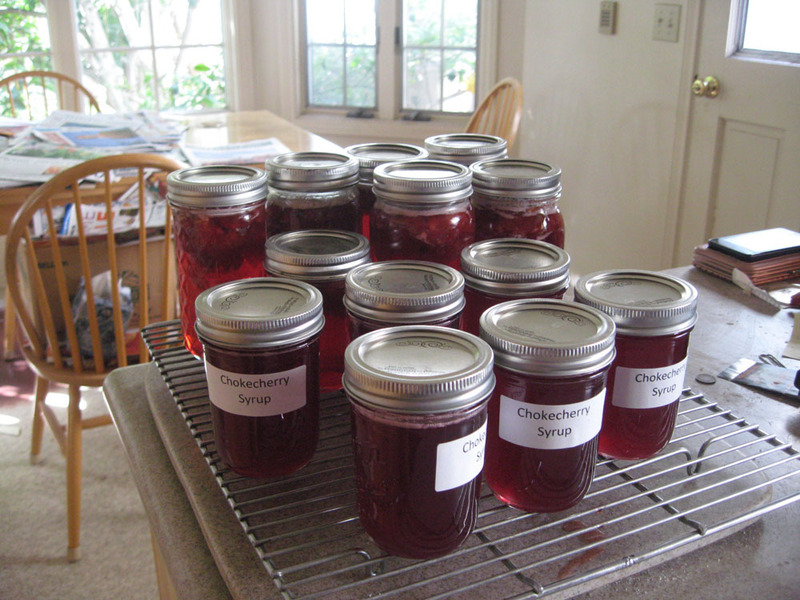 Pick ripe fruits each day, then freeze them until you have enough to make jam, jelly or other product. Just be sure that fruits are fairly dry, place them in freezer-weight plastic bags or other freezer-safe containers, label with product and date, and freeze. We like to double bag our fruits – helps preserve the flavor and prevent freezer burn. When you’re ready to use the fruits, thaw and use. Some fruits (Elderberries, Ribes species, blueberries and brambleberries) will freeze whole. Others will be a bit mushy when thawed. But all will be fine to use in most baked goods, jams, jellies, beverages, desserts, etc. Elderberries, currants, gooseberries, brambleberries, blueberries/huckleberries, rosehips and wild strawberries can all be preserved by drying them whole. This is a convenient way to store fruits for future use; the flavors last for up to a year. The dried fruits can be used for tea, ground dry (with spice grinder or mortar & pestle) for use in baked goods and desserts, or re-constitute them for use in many dishes. If grinding dried fruits for use in beverages or baked goods, we suggest (based on experience) that you strain out any large, hard seeds before adding the mixture to your recipe. Use a mesh kitchen strainer; the small, good stuff will go through, leaving the seeds in the strainer (discard the seeds). We have given detailed instructions for drying fruits in our Elderberry posting. We use these drying methods for all the fruits discussed above. If your strawberries or rosehips are large, you may want to cut them in half before drying. A good way to capture the flavors of summer fruits is by creating kitchen extracts. 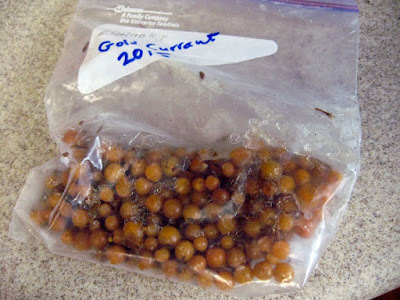 We discussed kitchen extracts, in more detail, in a past posting: http://mother-natures-backyard.blogspot.com/2016/04/california-gourmet-making-flavored.html. 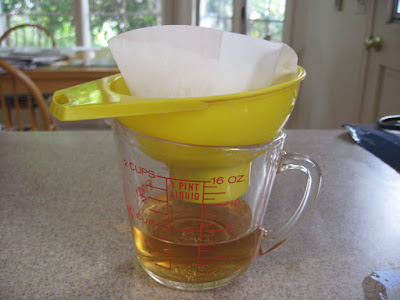 Alcohol extracts can be used just like purchased extracts (vanilla extract, etc.). 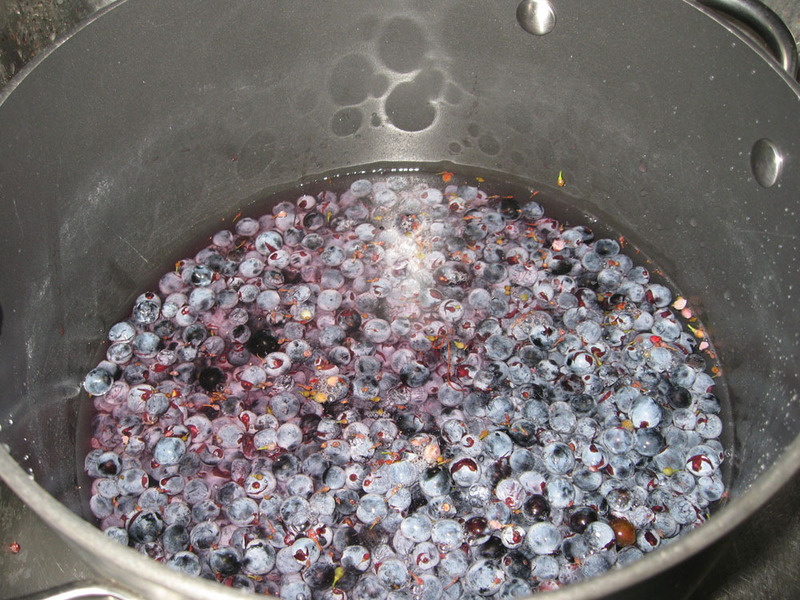 Kitchen extracts allow you to create berry-flavored dishes all year long. Creating kitchen extracts is simplicity itself. Place cleaned, crushed fruits into a clean glass container with a lid (we use canning jars with plastic lids, but any glass jar with a lid will do). Cover the fruit with vodka, making sure that all parts of fruit are covered (cheap vodka work just fine). Cover and place jar in a cool dark place (like a cupboard or pantry). If your lid is metal, place a double layer of plastic wrap over the opening before you screw on the lid. Be sure to label the jar with the fruit type and date. Swirl the fruits every other day. After one week, strain out the fruits. If you want a stronger extract, add more prepared fruits and proceed as above. When you’ve completed the last extraction, strain out the fruits, then filter the extract though a coffee filter (our favorite) or several layers of cheese-cloth. Bottle the extract in a clean (washed just before bottling with hot water) glass bottle, cap and label with product and date. Store with your other extracts in a cupboard or pantry. Native currants, gooseberries, brambleberries, blueberries/huckleberries and wild strawberries can all be used to make delicious jams. Just follow a standard recipe for the type of fruit you’re using. Be sure to follow the directions carefully, particularly if canning the product. Good instructions/recipes are available with the canning jars, with most canning pectin products, and on-line. All of the berries and berry-like fruits can be used to make juice. 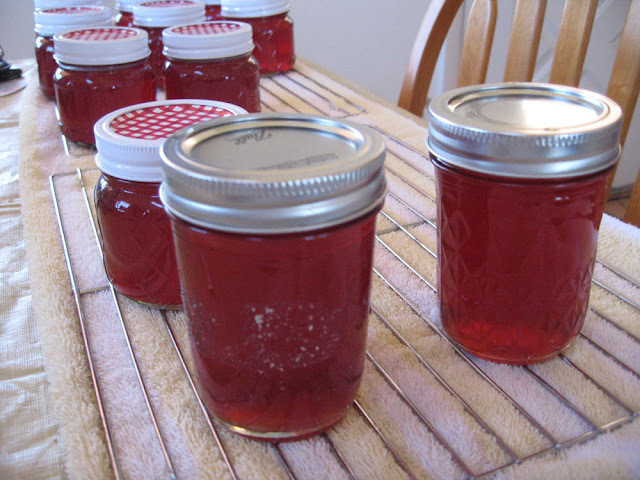 The juice can then be drunk fresh, frozen for later use or used in cooking or making jelly or syrup. Fortunately, making juice is really easy once the fruits have been cleaned. Place clean fruits in a heavy saucepan (non-aluminum is best). Crush the fruits with the bottom of a glass or metal measuring cup (don’t worry about crushing them all). Add water to about ½ inch over the level of the fruits. Heat the fruits on the stove over medium heat until the water begins to simmer. Turn down the heat and simmer for 20-30 minutes, until the fruits have released most of their color and flavor into the water. 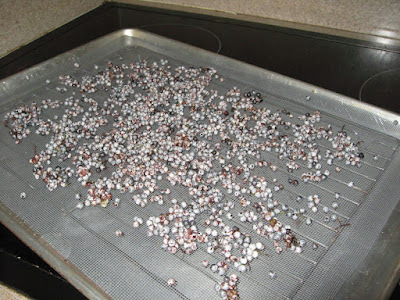 Remove from heat, let cool, then strain out the skins, seeds, etc. 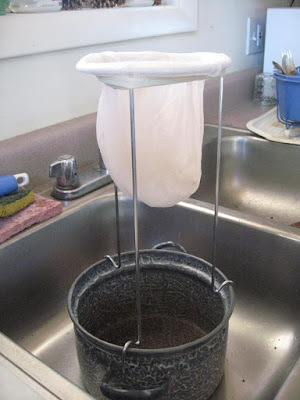 using a jelly bag (see above), mesh strainer or several layers of cheese-cloth lining a colander. Recycle the skins/seeds in the compost pile or as mulch in your garden. Don’t worry about the seeds sprouting – they don’t survive the heat! Use or store in the refrigerator (use within 3-5 days). We prefer glass beverage containers with lids for storage. You can also freeze the juice in freezer-proof containers for later use. If using the juice as a beverage, you may want to add a sweetener of choice. Taste and see – you may like it just as is. Use your favorite recipe for the appropriate type of berry. 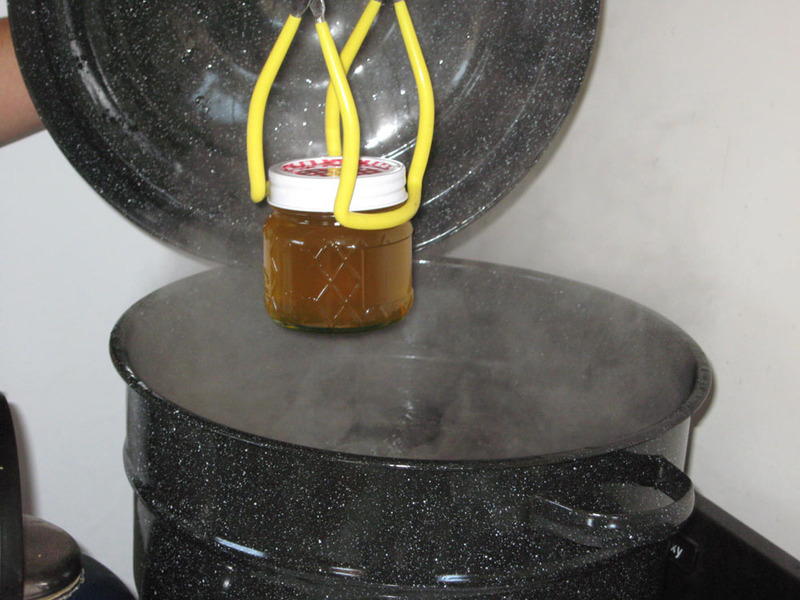 Good recipes for grape, elderberry, rose-hip, bramble-berry and other jellies are available in the pectin box or on-line. The native fruits make fantastic, unique jellies that are great as gifts. 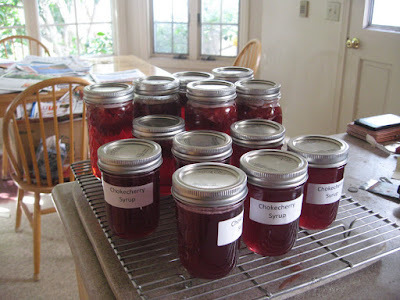 You may even want to combine several type of juice – or add some favorite spices like cinnamon or ginger to your jelly. Follow the canning recipes to the letter; you don’t want your canned jelly to spoil. Native fruit syrups are a wonderful way to preserve the tastes of summer. They can be used in so many ways. And you can even can them, if so desired, so they won’t need refrigeration. We find we use the flavored syrups all the time! Enjoy your preserved native fruits & berries! Native buckwheats are the stars of local gardens in August. 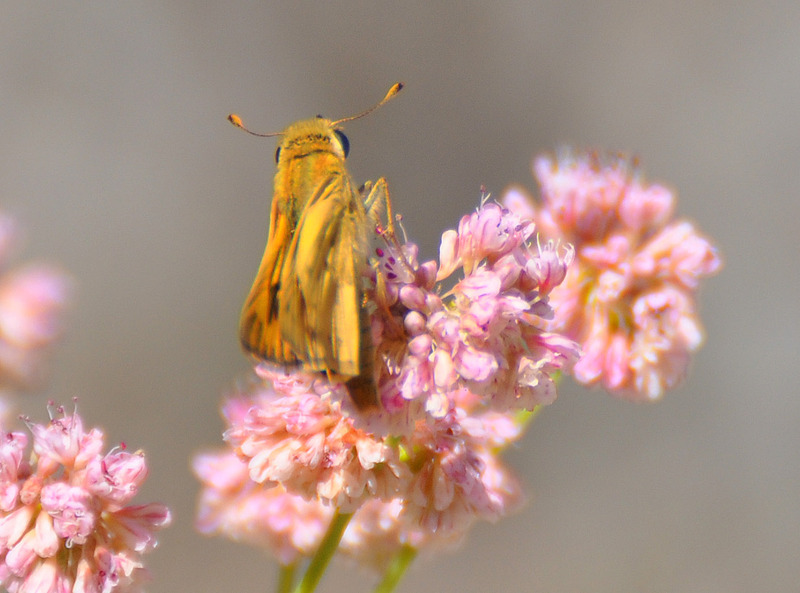 Their pretty, pink-white flowers and orange-brown seed heads attract a host of birds and insects; they are sometimes literally covered with butterflies and other insects. One local species, blooming now in Mother Nature’s Backyard, is the Seacliff or Dune Buckwheat, Eriogonum parvifolium (pronounced ‘air-ee-OGG-oh-num par-vee-FOE-lee-um’. Seacliff Buckwheat is also known commonly as Cliff Buckwheat, Seacliff wild buckwheat, Dune buckwheat, Dune eriogonum, Small-leaved wild buckwheat and Small-leaved buckwheat. It was first proposed as a species in 1809  and botanists collected it from the Los Angeles County coast in 1881 . Several varieties have been proposed; most now regard all of the coastal forms as a single species. 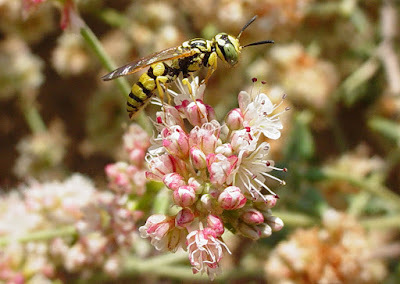 The wild Buckwheats – genus Eriogonum – are flowering plants in the family Polygonaceae (the Knotweed or Buckwheat family). There are over 250 species and sub-species native to California. Many California Eriogonums are half-woody shrubs (sub-shrubs) or perennials, although some are annuals. 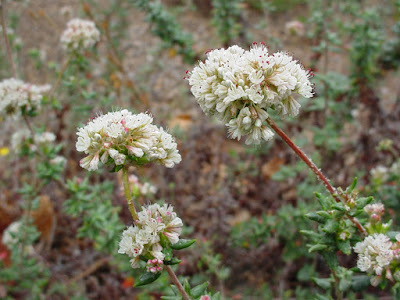 Eriogonum species are native to North America and not to be confused with the Asian cereal/flour buckwheats, which are in a different genus (Fagopyrum). Our native wild Buckwheats are not the source of buckwheat pancakes – that’s Fagopyrum – but they are a preferred food source for many a hungry insect. 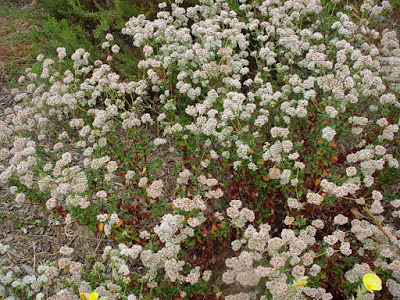 Dune Buckwheat (Eriogonum parvifolium) is a good example of the buckwheats native to western Los Angeles County. In the wilds, it still can be found in coastal areas from Monterey to San Diego County. It grows most commonly on dunes and bluffs near the ocean, where it provides important habitat under challenging coastal conditions. But in our area it also extends further inland, to areas covered by coastal shrubland and coastal sage scrub. 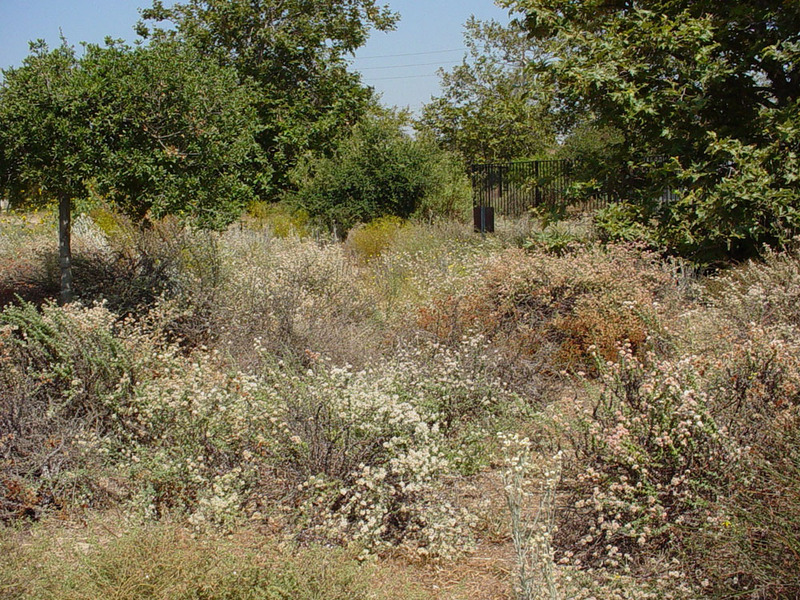 For example, there are still areas of native Coastal Buckwheat in undeveloped areas on the CSU Dominguez Hills campus (native coastal shrubland). So Coastal Buckwheat is right at home in Mother Nature’s Backyard as well as on the Preserve. Seacliff buckwheat is a sub-shrub (the bases of the branches are woody, while the newer parts are herbaceous) with numerous slender branches. On sand/sandy soils near the coast, the branches are prostrate (lying on the ground) or decumbent (reclining on the ground, but with up-turned tips). In less sandy soils – like our clay soil here at the garden - the branches may be fairly upright. The branches are 1-3 feet (to 1 meter) long and a mature plant may spread to 4-5+ feet wide. Overall, the plants usually resemble a series of upright stems, rather than the mounded, shrub-like forms of other local buckwheats (see photo, above). 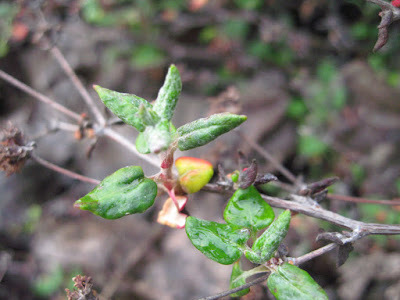 The leaves of Seacliff buckwheat are smaller than those of some native Buckwheats, less than an inch (3 cm) across - usually about 0.5 inches (1.25 cm) in our area. Leaves tend to be smaller in drier conditions. 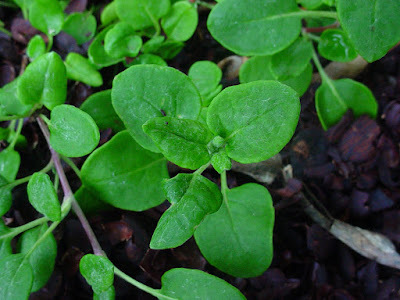 The leaves have a distinctive, rounded, buckwheat shape (see above) and are medium green above and lighter green beneath due to cob-webby hairs. In spring, the leaves are succulent, relatively flat and hairy. As the soil dries in summer, the leaves roll under at the edges – a water saving strategy. Under really dry conditions, the leaves become tightly rolled and finally are dropped entirely. They may also turn red – a stress-related reaction. These are mechanisms to allow the plant to survive the long dry summers associated with our mediterranean climate. Seacliff buckwheat is a real survivor! The main flowering season for Seacliff buckwheat is summer, although some flowers may be present throughout the year in a garden setting. In most years, the major bloom occurs from late July through August in our area. The flowers are just what an insect longs for: many tiny flowers, clustered in easy-to-access bunches and producing high quality nectar and pollen. As seen in the picture above, the flowers are cream-pink in color. A plant in full bloom is literally covered with blossoms – a sight to behold. The flowers attract a wide range of insects from native bees and butterflies to pollinator flies, beetles and wasps. If forced to choose one plant to attract summer insects, it would have to be a buckwheat. You’ll want to have a seat nearby, where you can sit and watch the many visitors. 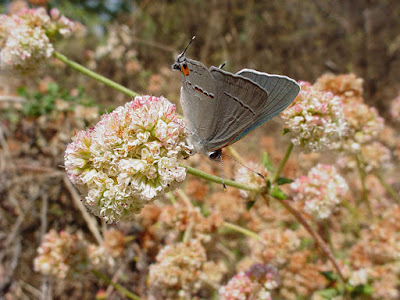 Dune buckwheat is host plant to two endangered butterfly species. Near Monterey, it provides larval food for the Smith's dotted-blue (Euphilotes enoptes smithi). 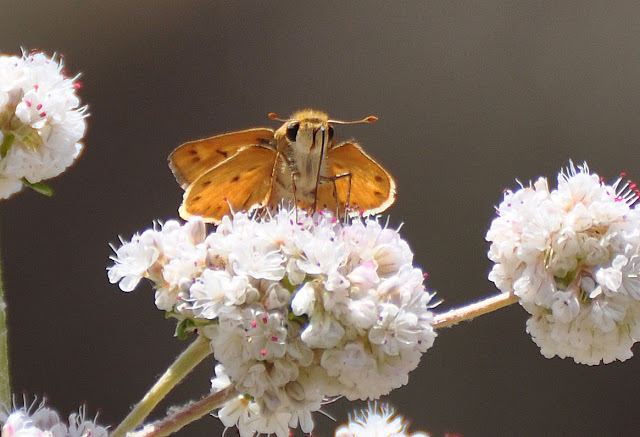 In Los Angeles County, it is well known for its role in the survival of the federally endangered El Segundo Blue Butterfly (Euphilotes battoides allyni). These tiny, short-lived butterflies can sometimes be seen fluttering around Eriogonum parvifolium on coastal dunes and sandy cliffs of the South Bay. The plants also attract a number of other butterflies, primarily the smaller Skippers, Duskywings, Marine Blues, Hairstreaks and others. Seacliff buckwheat is an easy-to-grow plant in the garden, providing you don’t water it much (or any) in the summer months. We’ve grown it successfully in sandy and clay soils. It needs full sun and probably does best within 8-10 miles of the coast. Sandy, salty maritime conditions are no problem for this tough buckwheat. Like several other local buckwheats (Ashyleaf buckwheat – Eriogonum cinerium; California buckwheat – Eriogonum fasciculatum; Giant buckwheat – Eriogonum giganteum) Eriogonum parvifolium is quick to establish. Plant in late fall/winter, give occasional summer water (every 2-4 weeks) the first summer, and it’s established. You will need to supplement in winter/spring if rains are scanty thereafter. But these plants require little summer water once established. 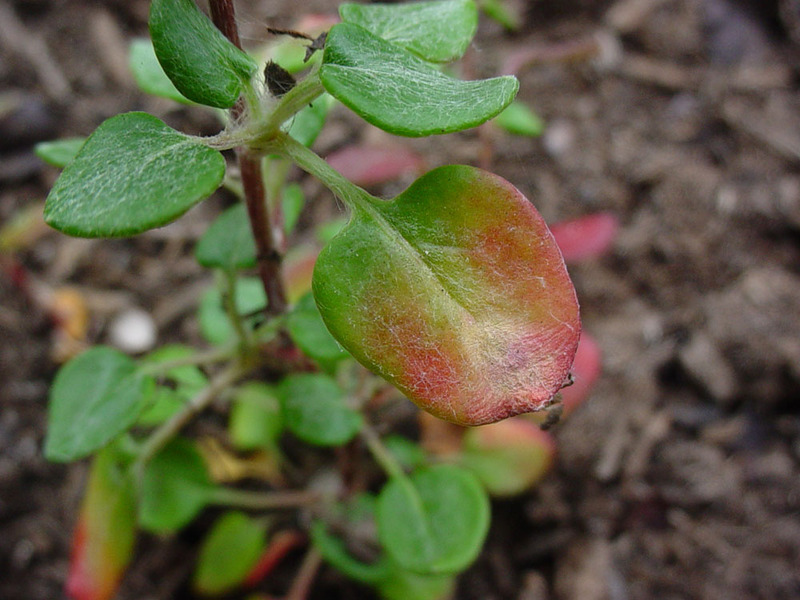 We may water our Seacliff buckwheat once or twice between late May and November in Mother Nature’s Backyard. We’ve watered once a month in another garden – clay soil, but on a slope. Be sure to pick a cool, overcast period for summer watering. These plants are fairly pest-free, but can be killed by root fungi, if soil is moist during warm weather. Seacliff buckwheat requires very little maintenance. We prune ours back by about 1/3 in late fall or winter to simulate natural ‘pruning’ by animals. We also remove old dead stems, if any, at that time. That’s about all the management that’s required. If the plants spread too much, simply cut them back. 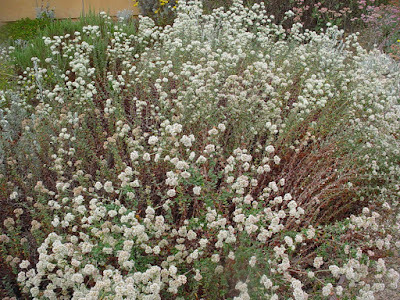 Other than that, Seacliff buckwheat is a plant that thrives on a gardener’s neglectful propensities. 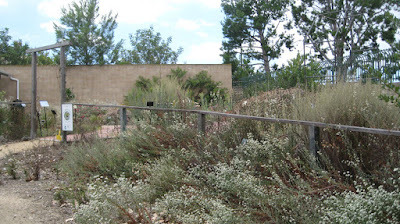 We’ve planted Eriogonum parvifolium in all the gardens we manage, as well as in restoration projects. 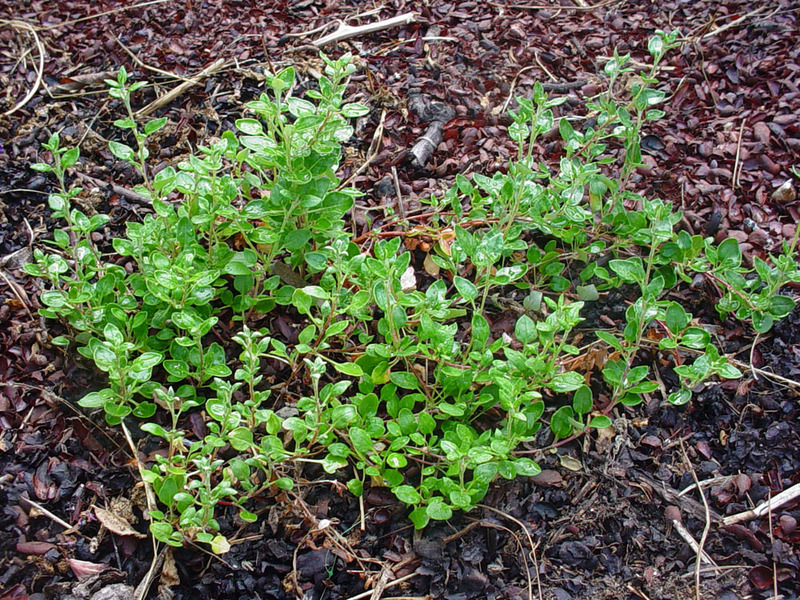 It makes a hardy, shrubby groundcover on sunny slopes. We also plant it along walls and fences, to ‘soften’ their harsh lines. 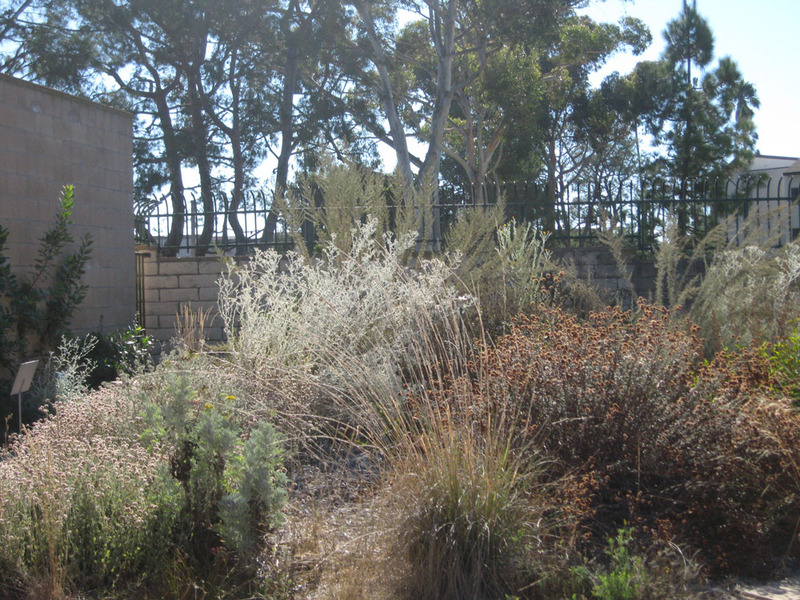 Seacliff buckwheat works well in mixed, water-wise beds with other native shrubs and grasses. We like to contrast the foliage of the several local buckwheats and often plant several species in a garden. They provide essential color and interest in the summer and fall garden. Their billows of soft colors remind us that autumn is coming and complement evergreen shrubs and the yellow sunflowers of fall. Their soft shapes are perfect for the natural cottage garden. 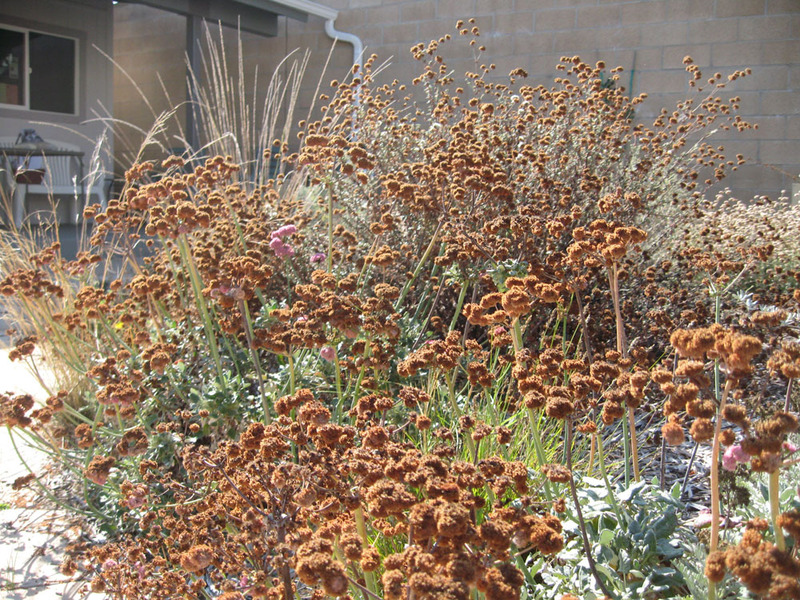 Of course, Eriogonum parvifolium is an important shrub for habitat gardens, attracting both insects and insect- and seed-eating birds. You can’t have too many buckwheats in a local habitat garden! The young shoots can be cooked in the spring and eaten as wild greens. Native Californians boiled the leaves to make a medicinal tea to treat headaches and stomach ailments. The flowers were steeped in water, and the water then used as an eyewash. All parts of the plant (including prunings) can be used to make brown and orange natural dyes. In summary, Seacliff buckwheat is a natural addition to coastal California gardens. It provides so much in a single plant: food, habitat, color and interesting shapes. They provide floral color in summer and fall, when other local native are dormant. To us, they help provide the ‘feel’ of coastal California, harking back to times past. We hope you’ll consider this easy plant for your own water-wise garden. 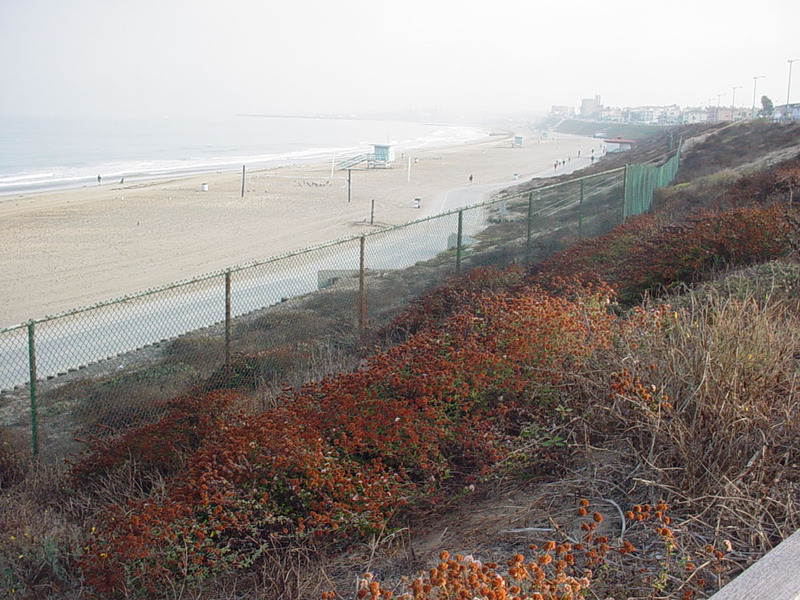 And if you live on the coast of Los Angeles County, you may even provide habitat for the endangered El Segundo Blue.